Sick of the commodities posts yet? No? Good, because that’s what is cheap right now. Let’s cover I don’t think we’ve discussed here before—BHP Billiton, the most diversified materials producer on the globe. It’s a niche long-term holding—like Tiffany, Disney, and Berkshire Hathaway—in that there are not a lot of peer companies from which you get to choose. If you want a long-term alcohol company in your portfolio, you can choose from Anheuser-Busch, Heineken, SABMiller, Molson Coors, Diageo, Brown Forman, and probably more, but I’m going off the top of my head. BHP Billiton is unique in that it produces iron ore, nickel, natural gas, oil, diamonds, coal, and steel. It has a very wide collection of assets that are heavily mined in Australia, Chile, and South America, with some operations in the United Kingdom as well. The company is spending $14 billion in developing new mines and oil fields—it is no laggard when it comes to capital investment (also, it’s in the process of spinning off its silver, coal, and aluminum mines to shareholders because the company wants to focus on the more lucrative mining and drilling operations). If you run value screens within the realm of blue-chip stocks, it should be showing up on your lists right about now: The price has declined from $71 in July to $53 right now. Even though companies do go from very overvalued to less overvalued, it catches my attention when a high-quality holding falls 25% in four months. Each ADR of BHP Billiton (and if you’re an American, you want to buy the British rather than Australian shares because of the tax treaty unless the price differential between the two becomes so steep it’s worth the additional tax and that would be rare) makes $5.18 in profit. This is a very serious firm that makes over $13 billion in annual profits, putting it in BP’s company. It’s very large. Even during the 2009 earnings collapse, it still made shy of $6 billion in net profits. This company is a beast. It pays out a $2.36 dividend, which amounts to a dividend yield of 4.45%. This is the highest yield BHP has offered this generation. Even during the recession, the yield only reached 3.3%. 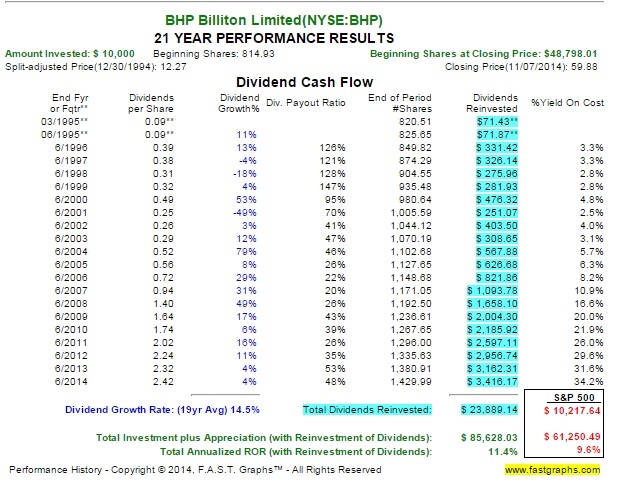 In 1999, BHP Billiton yielded 3.9%, and that’s the closest it has come to the present situation. Considering that earnings are on pace to grow in 2015 and 2016, based on current commodity prices and expected production gains, the current P/E ratio of 10 is on the undervalued side. Reasonable minds can disagree, but I would peg the current margin of safety at around 10% to 20%. This company’s long-term performance is fairly awesome—even with the current low price, it has returned 13% annually since 1987. It would have taken $36,000 in 1987 dollars to make you a BHP Billiton millionaire today. It has grown earnings by 29% annually over the past decade, and dividends by 23% annually over the past decade. If you have held the stock for twenty years and reinvested the dividends, you would have turned every dollar invested into $8.51. You’d be collecting $0.34 in dividends on every dollar invested. It’s a very solid company, with a very solid track record, that is currently on sale because of the dip in commodity prices. Even with this dip, it is still going to make over $13 billion in profits over the next twelve months. The valuations in the stock market amuse me right now. Take something like Colgate-Palmolive. It is an excellent company, something I’d want to own long term, and a great all-weather holding. But the current price…is getting out of control. It makes $2.28 per share in profits. But it trades at $68 per share. That is a P/E ratio of 30. Based on common sense, history, and projections of future cash flows, it will eventually revert to 20x profits. Heck, you could buy it at 20x profits for most of the 2000s! At best, it is worth $45-$50 per share. Now, profits grow every year, so you may never see a steep fall in the price of the stock, but you will see long-term performance of the stock lag the growth of the business itself for those that buy the stock here in early November 2014. Yet, in the very same market, BHP Billiton is on sale for 10x earnings and comes with a full margin of safety. It produces 84 million barrels of oil each year. It produces 839 billion cubic feet of natural gas. It produces 1.7 million tons of copper. And 5.2 million tons of aluminum. It has $8.8 billion in cash on hand. Exxon only has $6 billion in cash on hand! It’s giving you a dividend yield in the 4-5% range, historically high. It’s at 10x profits that are expected to grow. The dislocations in value between something like Colgate and BHP Billiton are amazing. BHP is historically cheap. It has a historically high yield. Its profits are growing. The long-term record is excellent. It is diversified across commodities. It has a management team that keeps the share count tight, refusing to dilute the owners. What more are you looking for in an investment?